How many responsibilities do you have? From meeting deadlines, making appointments, and even taking care of loved ones, our days are filled with responsibilities both big and small. And accomplishing these tasks gives us PURPOSE and GROWTH in life. The skills acquired in the Work for Food program allow vulnerable homeless people to succeed in new jobs. Do you want to learn more about the jobs our Work for Food clients receive? Volunteer with Food on Foot and you will hear wonderful work stories from our current Work for Food participants! Ronald H was a homeless participant in our Work for Food Program and graduated with a full-time job and his own apartment on Thanksgiving Day, 2016. He bounced from one location to another. After losing a job in Miami, Ronald moved back to his hometown of Los Angeles and soon found himself homeless. 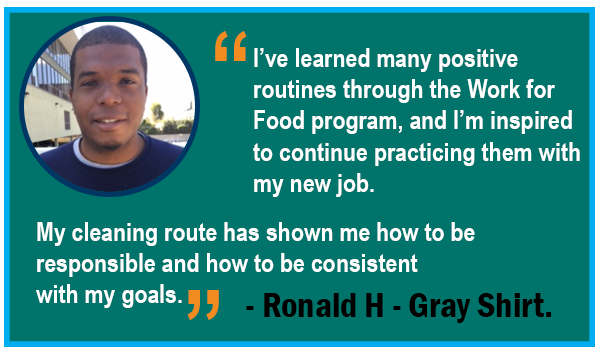 Ronald enrolled in the Work for Food program and turned his life around. Ronald went through group therapy and life-skills training. He started to create a game-plan made of positive work habits. And by cleaning the streets of Hollywood every week, Ronald was able to apply these skills in a real-world environment! Ronald now has a full-time job as a security guard and is continuing to implement all the outstanding habits he’s acquired! When you volunteer with Food on Foot, you do more than help the community. You INSPIRE our homeless clients to practice the same positive work habits you demonstrate during the serving. Our homeless clients exhibit these same responsible skills during their Hollywood cleaning routes. And just like crossing a stepping stone, the homeless you inspire apply these newly acquired skills into future jobs and responsibilities. Please volunteer and be a positive influence in the work habits of our homeless clients!! Click here to sign up. As a volunteer, YOU will meet our happy Gray Shirts and graduates. They will enthusiastically tell you stories about their full time job. You will see how STRONG they feel every time they receive their paycheck! You can volunteer with Food on Foot on ANY SUNDAY in our Hollywood Serving location. Sign up to volunteer here!